2. Combine first eight ingredients above and mix well. 3. Heat oil and honey together in small pan until melted. 5. Spread mixture onto cookie sheets and bake for approximately 20 minutes. 6. When cool, add raisins and currants. 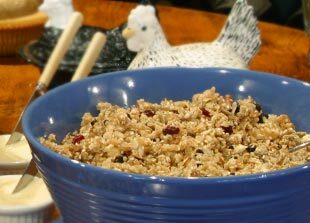 Substitute dried cranberries for the raisins for a bit more zing. Try doubling the coconut.